8Whether for home or work, you’ve probably all seen a key stamped with “do not duplicate” or “do not copy.” Seems like a surefire way to keep your keys from being copied, right? Well, if you’ve ever been in a pinch and you’ve had a “do not copy” key copied, you know how ineffective that stamped message really is. Don’t worry, you aren’t going to go to jail, and you aren’t about to be fined by the authorities. Copying a “do not duplicate” key usually has no repercussions at all! So why are keys still stamped with that little warning, if it does no good? At Rocket Locksmith, we want to help you keep your home and business as secure as possible, so here’s what you need to know about “do not duplicate” keys. First and foremost, we want to make this very clear: having your keys stamped with some variation of “do not copy” doesn’t do any good. In fact, in most cases, it actually does more harm than good because so many people with a “do not duplicate” key mistakenly believe that it makes their keys safer. 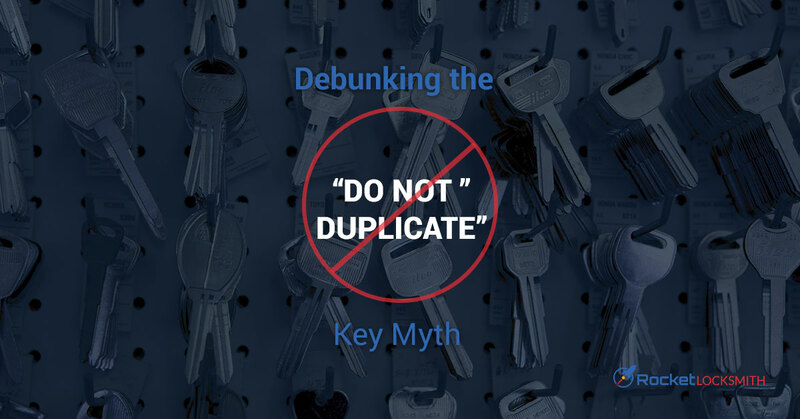 That false sense of security can be detrimental because it doesn’t actually do anything to keep the key from being duplicated dozens of times. According to the Associated Locksmiths of America, the standard locksmith policy on these keys is to “inform the consumer that the use of keys stamped ‘Do Not Duplicate,’ or similar wording, is not effective security, and further that the use of such words is deceptive because it provides a false sense of security.” Basically, locksmiths will make keys with “do not duplicate” on them, if you really want, but they should also warn you that the little message isn’t going to stop any locksmith or key maker from copying the key. If you’ve ever seen a standard key being copied, you know it can be done in a matter of minutes. All a locksmith has to do is carve out notches to the appropriate sizes. In order to make key copying more difficult, one way to improve security is to use keys that are more complicated to duplicate. This can be keys that are dimpled and notched on the flat side, rather than the narrow side, or keys with multiple layers of grooves. Your local locksmith can direct you to keys that are harder to copy as well as styles for which blanks are only given in limited numbers to trusted key-duplication partners. The standard lock is a 5-pin lock. The idea is that the notches in your key will line up with each of the pins and raise them all simultaneously to the correct heights so the tumbler will turn and the lock will disengage. However, this video shows a 5-pin lock with clear housing so you can see just how easy it is to pick a lock quickly with a bit of know-how. A lock with additional pins, like a 7-pin lock, will be more difficult and take longer to pick, so many burglars tend to avoid targets with those locks. When a burglar can’t easily pick a lock, the common go-to is to force or drill a lock. In order to prevent this, ensure your locks are installed properly and choose locks made with sturdier materials. Where Can You Make a Copy of a Car Key? Rocket Locksmith Has You Covered! Rocket Locksmith is your local St. Louis source for knowledgeable help for everything from key-cutting to improving home and business security. Contact us today for speedy service across St. Louis!